A high-quality base sounder with an impressive 92dB(A) sound output for use with C-TEC's HP508 Hush-Pro BS5839-6 Grade C Controller. Certified to EN54-3 & 17 by the LPCB (pending). 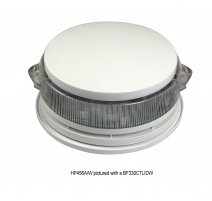 White ceiling fixing plate & detector spur wires included for optional connection to a Hush-Pro detector/base allowing it to be used as part of stacked sounder/detector/base combination. Compatible with our HP508 Hush Controller. Up to 8 field devices (detectors, sounders and/or I/O units) per Controller. Up to 8 additional field devices can be connected but this may impact on battery standby times. Approvals/certifications Certified to EN54-3 & 17 by the LPCB (pending). Protocol/compatibility Compatible with C-TEC's HP508 Hush-Pro Controller. Application/operation Designed to be ceiling mounted - either stand-alone with a red or white cap or as part of a stacked Sounder/Detector Base combination. Supply/operating voltage 27 to 40V DC. Quiescent current 460uA - 5.5mA @ 24V. Nominal SPL (Sound Pressure Level) 92dB(A) on evacuation (Fire Level 2) tone. See notes for tone details. Alarm current 5.5mA (Sounder on max). 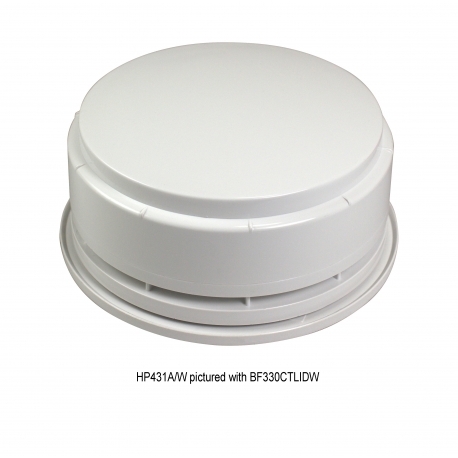 Product dimensions (mm) 122mm diameter x 46mm deep (not including optional CAST detector and base). IP Rating IP21C (Type A). Notes Evacuation (Fire Level 2) tone: 610Hz for 0.5s, 810Hz for 0.5s. Local (Fire Level 1) tone: 500-1200Hz, slow whoop, for 3.5s on, 0.5s off.